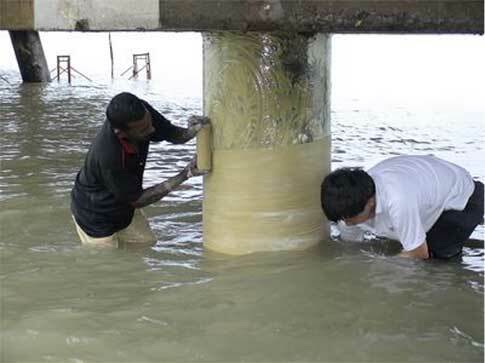 Protection systems developed specifically for the protection of new and existing jetty piling in tidal zones, providing splash zone protection for steel, concrete and timber structures in harsh environments where conditions are too severe for paint systems, epoxies or other forms of conventional protection. Waterproof coating and fabricated jacket system secured by a selected strapping system specific to different environments that combats exposure to weathering, prevailing currents, marine growth, pollution and mechanical impact in marine environments .The system displaces water and develops a water resistant bond for concrete piles, preventing spalling and rebar corrosion, and prevents infestation of marine borers on timber piles. Extensive consultancy service available from manufacturer to meet specific requirements.